Atchison Kansas has launched a new bike share program, Atchison County Bike Share, organized by Live Well Live Atchison, and funded through a Pathways to a Healthy Kansas grant from Blue Cross Blue Shield of Kansas. The Atchison County Bike Share is a free program that will allow people to check out bikes much like checking out a book at the library. To check out a bike, riders will only need to provide a picture ID and sign a waiver. Children 12 and older may provide a student ID, YMCA membership card, library card or something similar. 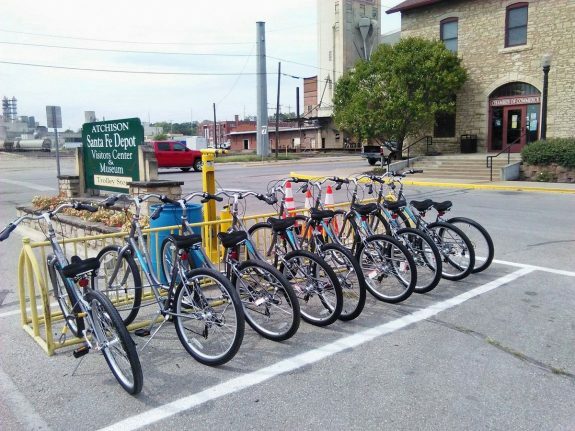 “Our goal for the Atchison County Bike Share program is to encourage cycling as a mode of transportation as well as recreation. Having a hub at the Visitors Information Center (at the Santa Fe Depot) also will encourage tourists to explore our community on bike. The hub at the YMCA is an obvious location and provides easy access to our beautiful Riverfront Trail,” Clements said. Starting with two locations, they hope to expand throughout the county.